Son La province located in the North West of Vietnam. It is one of the province has its largest square in the country. It borders with Dien Bien Province to the west and Thanh Hoa to the south. The province is borders also Huaphanh province of Laos to the south and Luangprabang of Laos to the south west. Center city: Son La City locates in the west of the province. 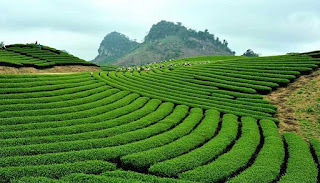 Districts: Quynh Nhai Districts, Muong La Districts, Thuan Chau Districts, Phu Yen Districts, Bac Yen Districts, Mai Son Districts, Song Ma Districts, Yen Chau Districts, Moc Chau Districts, Sop Cop Districts and Van Ho Districts. Climate: there is the humid subtropical climate in Son La province. There are two seasons in this area in which the winter is from October to March and the summer from April to September. The average temperature in the province is 21 to 23C degree. It is considered that the best time for travelling to Son La province is from the end of January to March, September and November because they are the best time in here with the local flowers blossom also the festival. Transportation: Travel conveniently by land to the province and from it to other provinces. Ethnic groups: There are more than 10 ethnic groups who live together in here. They are Xinh-Mun group or called Puoc or Pua ethnic group, Muong, La Ha, Khang, Hmong, Kinh, Tay, Lao, Kho Mu and Dao ethnic groups. Son La Museum: there are the things related to the ethnic groups and history also the time war that displayed here. The museum locates in the area of the historical sites of the province. Son La Prison: locates in the area of the historical sites of the province. The prison was built in 1908 by French. Mong Village: or called Moong Village. The village has the famous hot spring located far from Son La City about 7km. Tham Tet Toong Cave: it is located far from center of Son La City about 2km. This is one of the amazing caves with the wildness for you to explore. Muong La District: one of two famous districts that attract people who come to visit by the great rice field, impressive landscape and kind local people. Ngoc Chien Commune: the commune belongs to Muong La District. There are the fascinated rice fields here. Chieng Khoi Lake: the lake is in Yen Chau district. The lake is large with the calm water face and it is wonderful like a gorgeous natural picture. The lake is far from the center of the district about 4km to the south. Chi Day Cave: the amazing cave is located in the Yen Chau District too. The cave is famous by its mystic beauty inside. It is closed with many legends and stories that the local people believe in. Pa Uon Bridge: one of the highest bridges in the country. The bridge is in the area of Quynh Nhai district. From here you can take the best picture to the nature around with romantic sites and amazing landscape. Muong Bam Tower: the tower is called That Ban Lao that belongs to Thuan Chau District. It was built in a hill with 5 towers. This is also one of the famous sites of the province in which you can understand a little bit about the technique in architecture of local people in the past. Bac Yen: the area where there are 7 ethnic groups who live together. It is famous place because it is attached with Hong Ngai Commune where created the wonderful story of the famous writer named To Hoai. Tien Phong Lake: the nice lake is located in Mai Son district. It is far from Son La city more than 20km. This is the ideal place for your time to enjoy the boat tours and fishing tour in the romantic site. Mai Chau district: one of two famous tourist district of Son La provinces. 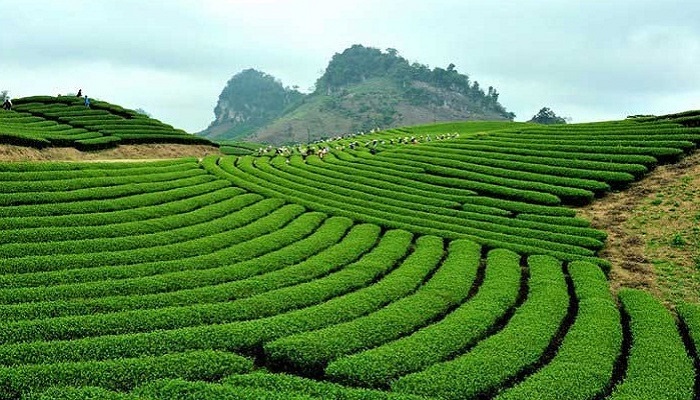 It attracts people by the endless local flower fields in the season and the spreading tea farms out. Called the nice highland in the North, Moc Chau is the fascinated area for all tourists to explore the wonderful sites in here. Festival for Peace: happened in the end of January and the beginning of February each year. Xen Muong Festival: called Ban Flower Festival is in 31st December each year. Buffalo Fighting Festival: is in Phu Yen District. It happens to encourage the local people in the work of breeding cattle. Boating race Festival: happens in Quynh Nhai District in each event in the district especially in The New Year Holiday and Independent Day. Muong A Ma Festival of Xinh Mun Group: happens in the time of December to February each three year. Xen Pang A Festival of Khang Ethnic Group: is in the time of October to December each three years. There are many local specialties in the province such as thịt khô trâu (dried buffalo meat), pa pinh top called cá nướng gập (local grilled fish), cơm lam ( rice in the bamboo cooked), cháo Mắc nhung (porridge with the green local fruit like small potato), xôi sắn (cassava sticky cooking), local mango, bananas liquid, local purple garlic, local green tea, local sticky rice cake, snails from Suoi Bang, veal meat cooked with local pickled tofu and local cucumber.